It's finally done! Here is my finished improv pineapple quilt that I made as part of the FreeSpirit Modern Solids Challenge. 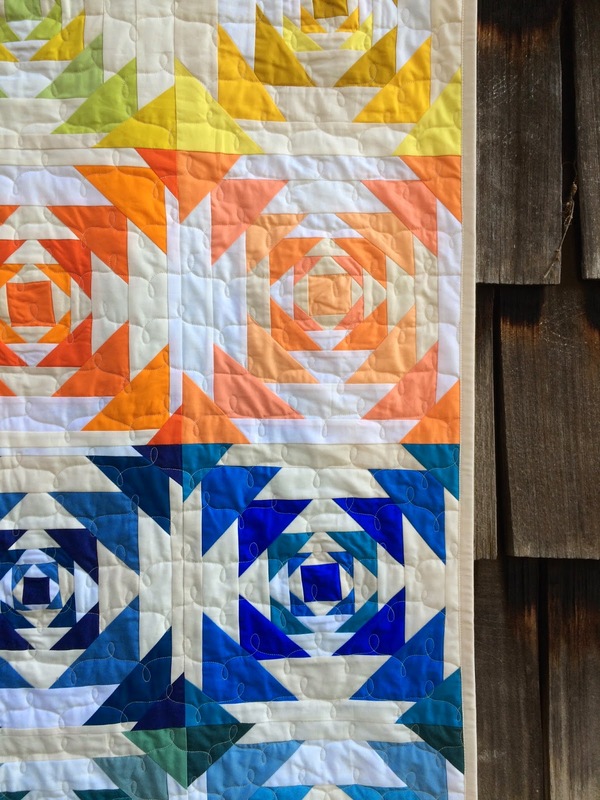 As a reminder, a handful of designers and bloggers were asked to create a quilt that was a modern interpretation of a traditional quilt pattern, using Denyse Schmidt's Modern Solids fat quarter box and additional FreeSpirit Fabric. And it was quite a challenge, but I had a great time making it, and I'm really pleased with the result. I choose the traditional pineapple quilt block as my inspiration, but instead of following a pattern, I made my blocks improvisationally. I really love the irregular shapes and movement that this type of construction lends itself too. 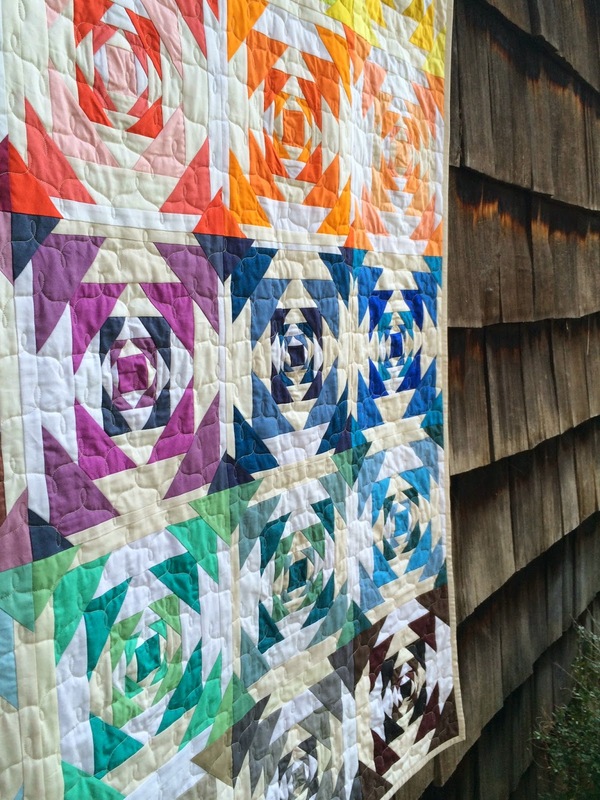 This quilt took me about two weeks to complete, from start to finish. 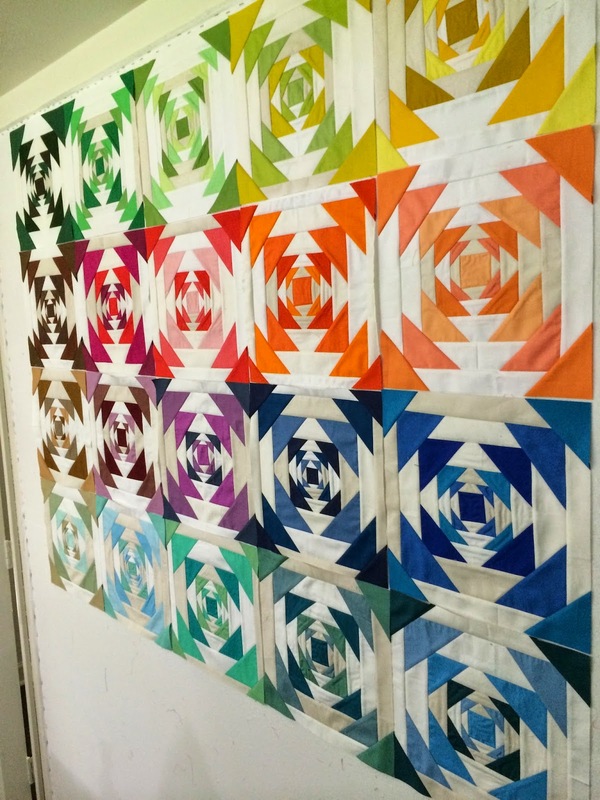 The blocks each measures 12" square (finished) and the quilt measures 60" x 60", as specified by the design challenge. 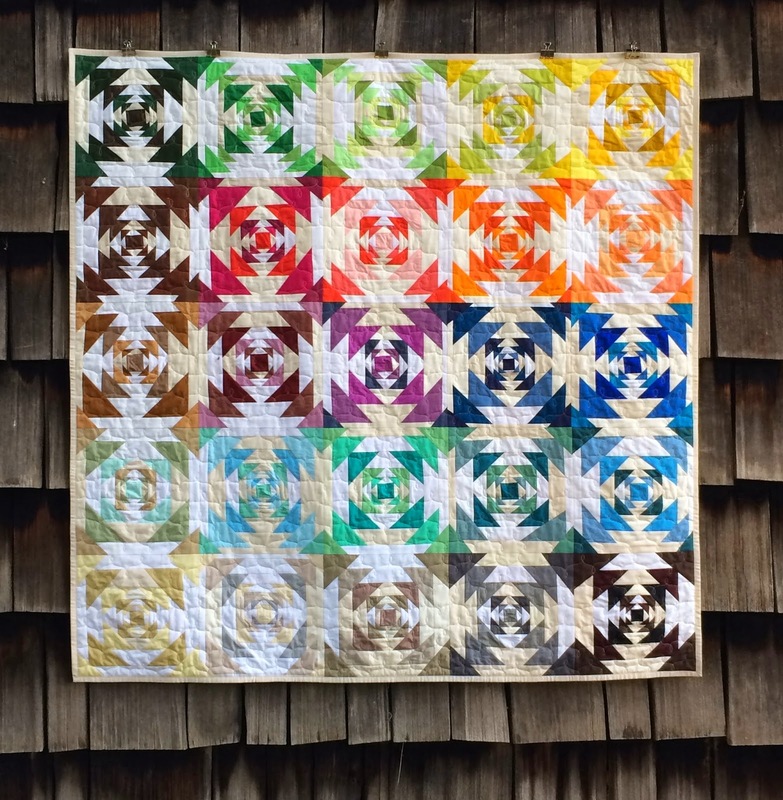 It took me about an hour to make each block, and I'm proud to say that I used all 75 colors of the bundle in this quilt. 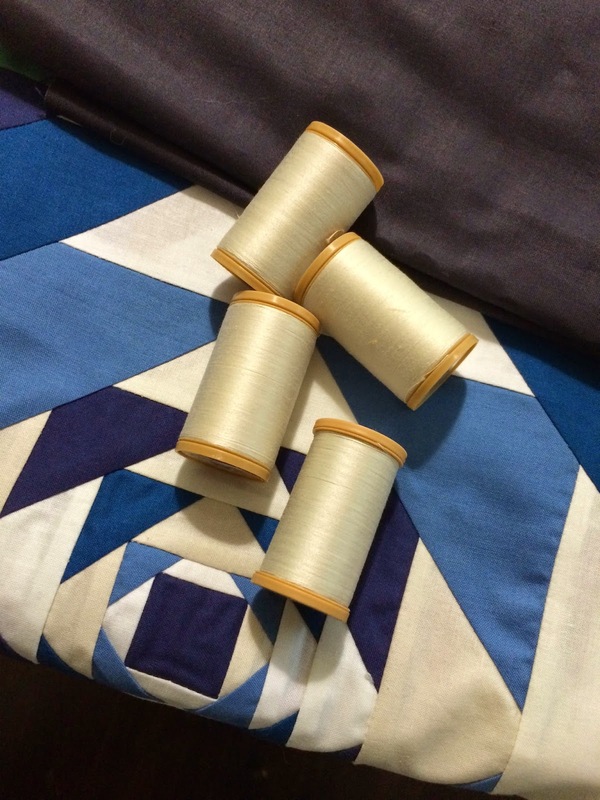 That was a challenge in and of itself, especially for someone like me, when I typically use only two to four fabrics in each of my projects. 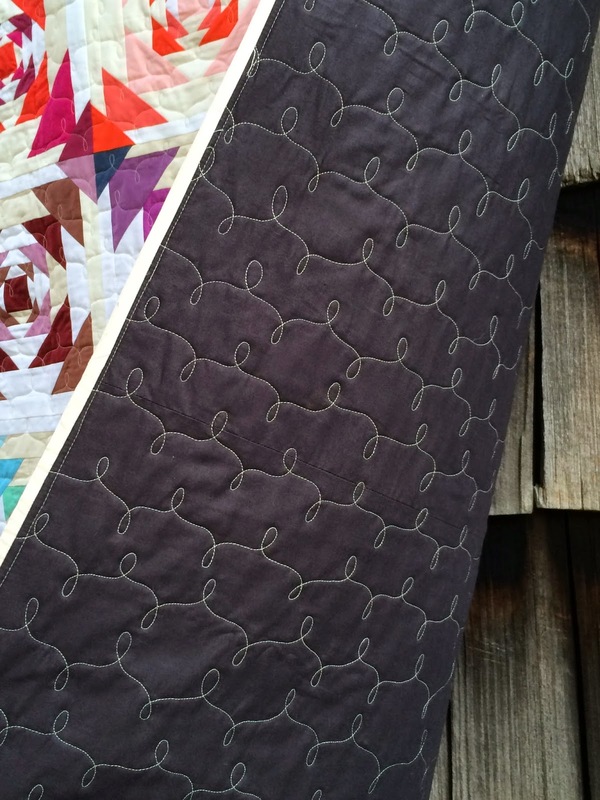 I backed the quilt with FreeSpirit Designer Solids in Raven, which is a gorgeous, deep dark gray. 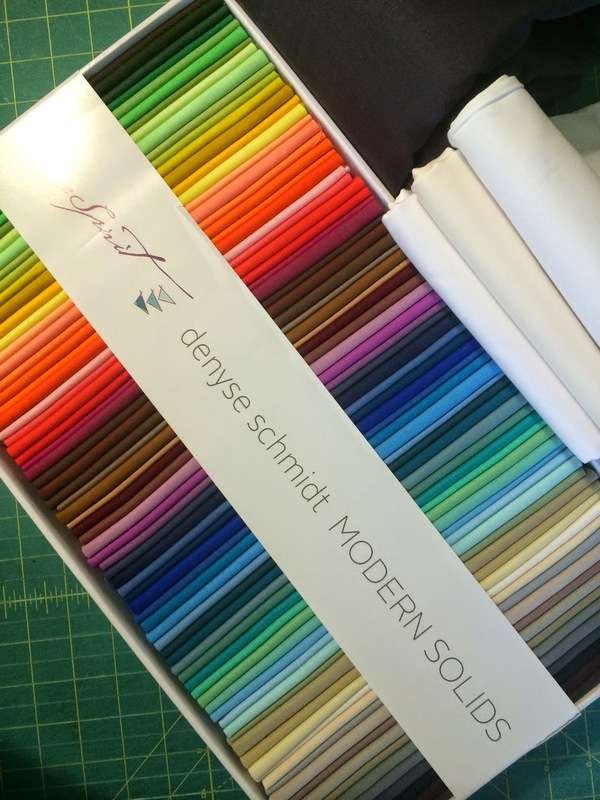 As I said above, I used all 75 of the colors that are included in Denyse's Modern Solids bundle. 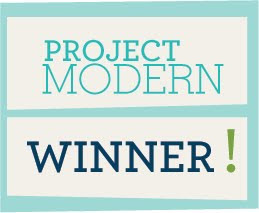 While we were not asked specifically to use all of the colors in box, I made that part of my design challenge as well. I used an additional four FreeSpirit Designer Solids throughout the blocks: Winter White, Mist, Arctic White and Natural. 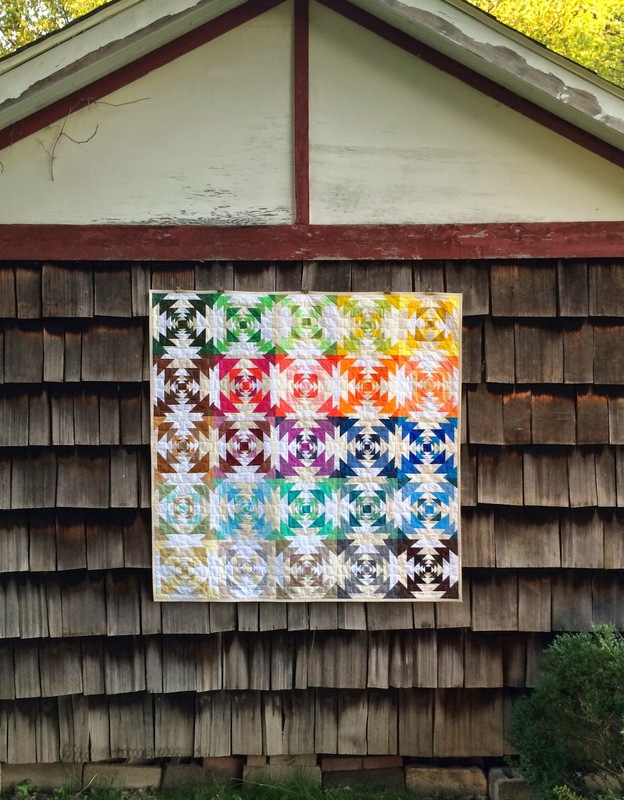 So, all in all, this quilt contains 80 different colored fabrics. 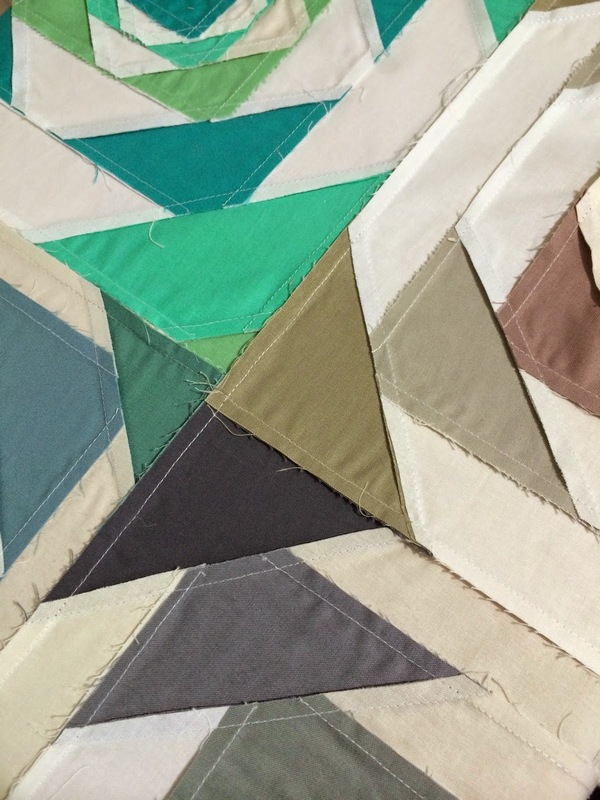 Another design stipulation that I gave myself was to use the colors straight out of the box, that is, to create my blocks using the fabrics in the same order as they are arranged in the bundle. 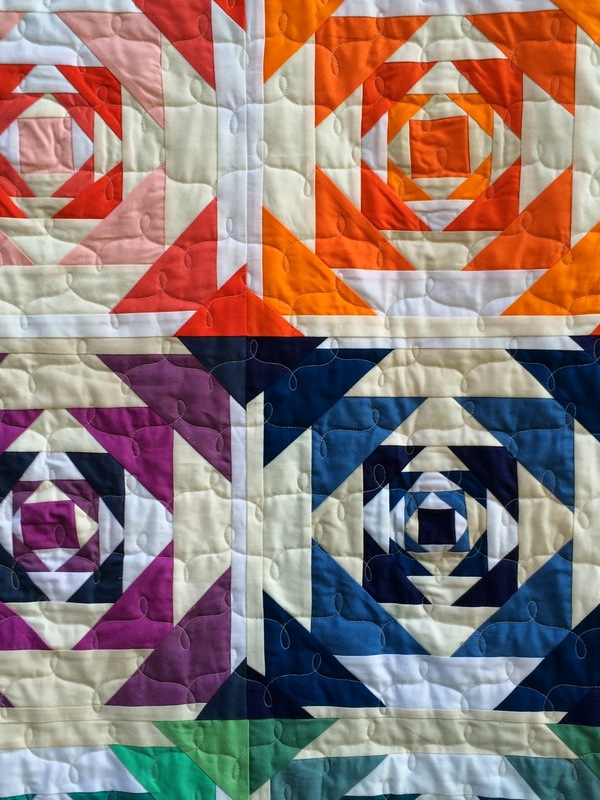 Each of the twenty five quilt blocks is made up of three colors, so this was an easy way for me to make sure that I was able to use all 75 colors. I arranged the blocks in five rows each consisting of five blocks, starting with the upper left; for the second row, the orange block on the far right side follows the yellows in the box, and the order continues from left to right. Then row three continues the order from right to left, row four runs left to right, and finally, the last row runs right to left. Here's what my box looked like after all of my blocks were finished. 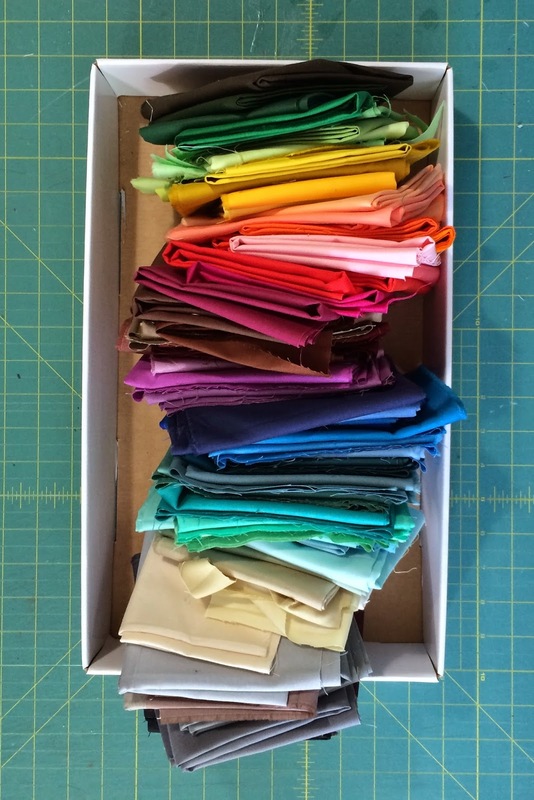 I kept all of the fabrics in the same order as they were originally, as a fun visual reference to the layout of my quilt. During the construction of the blocks, I pressed all of the seams to the side. This was quicker than pressing them open, but there are some areas where there is a but of bulk from the seams. I quilted it on my long arm machine last night, using Coats Machine Quilting thread. For the design, I used a freehand figure eight pattern that has been my go-to technique for the past few months. 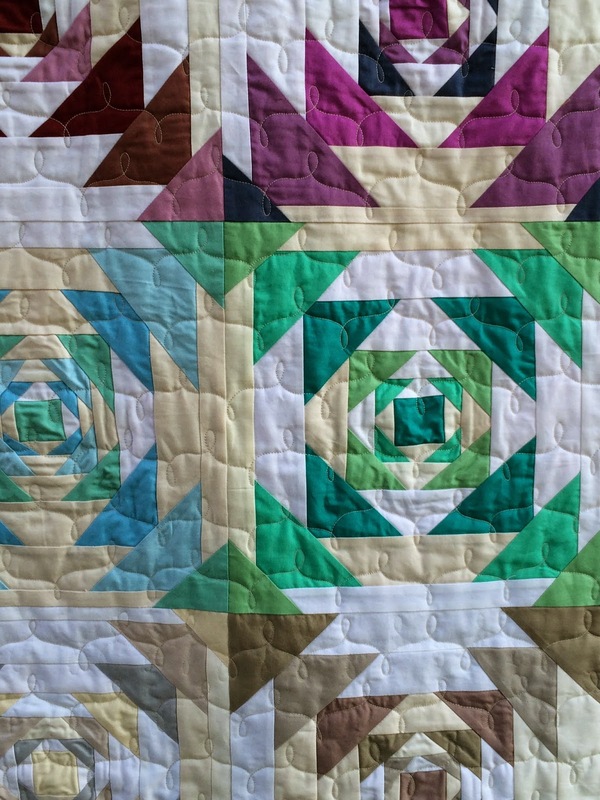 I really like the organic quality of this quilting design and I feel like it doesn't distract from the design of the quilt itself. And I burned the midnight oil to get it bound last night, too. 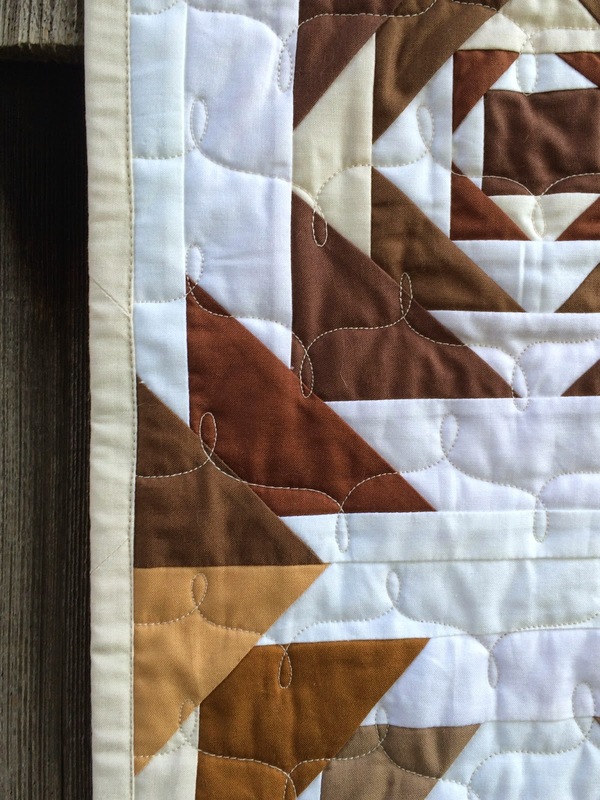 I used Natural for the binding because I felt like it would frame all of the colors of the front nicely. 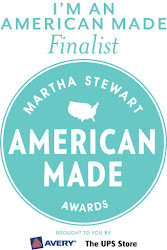 Thank you, Denyse, for designing such a gorgeous palette of solid fabrics. 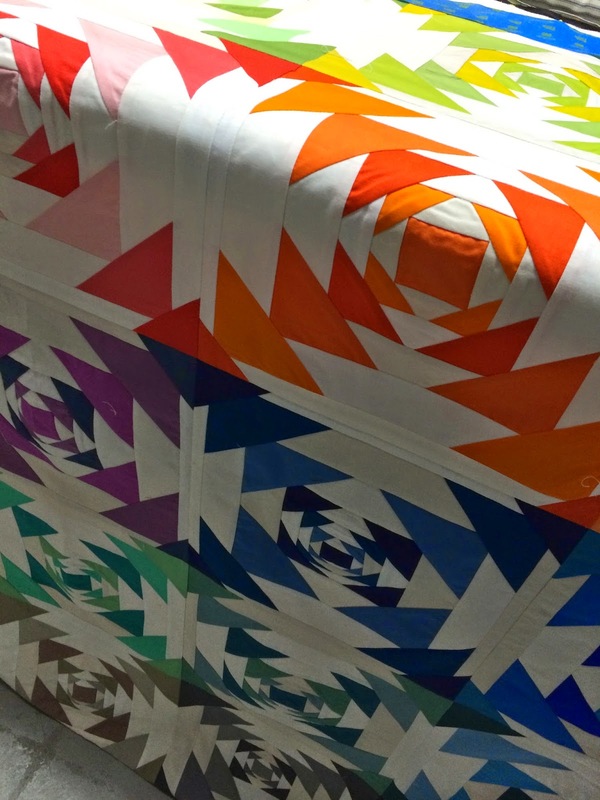 They were a delight to work with and I feel like they are certainly a must have for any modern quilter. And thank you to all of you who have been voting for me everyday. Please keep it up! And don't forget to enter my giveaway as a thank you, as well!